Sweat was pouring. Legs were aching. Bodies were dehydrating. And still the commandments coming down from the top of the bench were unchanged. Be aggressive. Push the puck. Score. “I think both coaches were crazy,” Larry Hendrickson said with a chuckle. Mike Randolph was the Duluth East coach in the epic five-overtime 1996 state semifinal many longtime fans and historians rank as the greatest game in state history. Turns out Randolph had the same game plan as Hendrickson. “There was no neutral ice play,” Hendrickson said. “It was all 3-on-2s and 2-on-1s. Both teams were gambling. Karl would be Karl Goehring, the Eagles’ 5-foot-6, 160-pound goaltender who found himself looking square into the eye one of the greatest goal scorers in state history in the Greyhounds’ Dave Spehar. Spehar, a senior, had scored four goals in Duluth East’s 7-1 quarterfinal triumph over Blaine the day before. His scoring outburst wasn’t much of a surprise. State tournament hat tricks had become as routine as taping a stick for Spehar, who in 1995 had three-goal games in all three of the Greyhounds’ state tournament victories as they cruised to the Class 2A championship. “The thing I remember about Dave is just how gifted he was around the net,” Goehring said. “He had this knack, and not only that he had the hands to go with the knack. 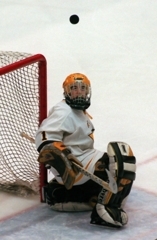 Goehring, always considered too small to be a high-level goaltender, frustrated shooters and proved talent evaluators wrong at every turn. After a stellar season of junior hockey in the USHL, Goehring would go on to win a national championship with the University of North Dakota. 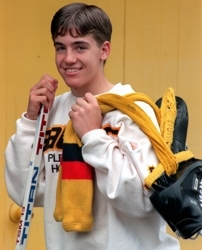 He played eight seasons of professional hockey, mostly in the AHL. "The biggest thing about Karl was his work ethic," said Chris Sikich, a senior forward for the Eagles in 1996. "He’s the hardest working kid I ever played with. He wanted to be perfect. "If we won a game 8-1, he would come into the locker room upset about the one goal he gave up." Clips of Goehring making save after save are a requirement in any historical piece recounting the state tournament’s most memorable games and moments. Matter of fact, Goehring said he was sitting in a restaurant in Winnipeg a few years back when up on the TV screen he saw images of himself at the state tournament. 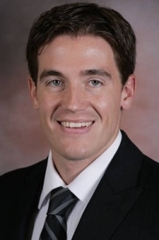 Karl Goehring is a volunteer assistant coach at the University of North Dakota and the director of the The Hockey Acacemy in Grand Forks, N.D.
What people forget, Goehring said, is that the Duluth East game was not for the state championship. No, the Eagles had to regroup and play Edina the next day. Goehring made 21 saves as Apple Valley beat the Hornets 3-2. Goehring, the valedictorian of his class at Apple Valley, said the mental preparations for Edina started at breakfast the morning after beating Duluth East. Goehring said he was reminded by Apple Valley assistant coach Paul Ostby that another, greater, opportunity lie ahead. “(Ostby) really did such a good job of mentally getting me in the right place,” said Goehring, who is the director of The Hockey Academy in Grand Forks, N.D. and serves as a volunteer assistant coach for the University of North Dakota. Apple Valley’s 1996 state title remains the lone championship in the program’s history. “It is still something that gives me chills thinking about it and and how special it was for our team,” Goehring said.